During Memorial Day Weekend you will learn how the annual migration of alewives influences other creatures along the Damariscotta River. May is a very busy month on the River and the crew plans on sharing all the activities. 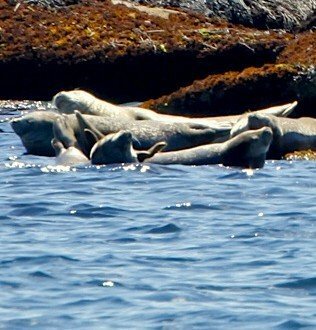 Seals give birth to their pups just as the springtime migration of alewives introduces an abundance of food to the tidal river. The River Tripper will have special Alewife Run Tours Saturday, Sunday, and Monday at 2pm. The trip is partially narrated about how the annual migration of alewives effects the habitat on the Damariscotta River and the amazing interdependency of alewives and its wildlife. During the Alewife Festival on Memorial Day Weekend the profit of ticket sales will be donated to the Damariscotta Mills Fish Ladder Restoration Project.